Ahhh my second visit to F'Amelia (@FAmeliaRisto)! After my dinner there the first time around a month ago I knew I wanted to go back and try more of their pizzas and pastas. 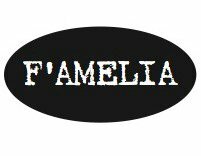 Not only did the food make a lasting impression, I also love F'Amelia's quaint and cozy ambiance. This time, my friend Adrienne and I were seated in the room with the bar and the pizza oven. We sat at a table against the wall (funny how the last time I was seated against the wall as well but directly opposite in the other room). Anyway, this was our view that night. For more pictures of the restaurant, please click here for my first post. Bastianich Rosato - a lovely Italian rose wine. Roasted Warm Ontario Vegetable Salad with Mustard Greens - Adrienne and I both really enjoyed the salad as everything was extremely fresh; roasting the vegetables also really brought out their natural sweetness. It was a nice change to have a warm salad on a cold night. Oh and I ♥ artichokes! Braised Rabbit Pappardelle - Juicy and soft, the braised rabbit was very very tender. The pappardelle was done al dente...perfect. 3 Funghi Pizza: Crushed San Marzano tomato, fior di latte, mixed sauteed mushrooms, Parmigiano Reggiano D.O.P., basil, extra virgin olive oil - MmMMmm mushrooms! Great veggie pizza if you're looking for something light as it had a really thin crust. Loved the random dollops of Mozzarella. House made Dessert Liqueurs - Limoncello and Blueberry - Courtesy of F'Amelia, Adrienne and I got to try these lovely liqueurs that were made in-house before our dessert. Literally a pizza, we were both floored at the size of it! I initially ate it with a knife and fork but gave up all that and ended up using my hands =D Warm baked apples and cold vanilla ice cream is always a winner for me (maybe a bit too much dough for us as we were already overloaded up with carbs from the pizza and pasta). We didn't end up finishing this and just ate all the apples at the end.